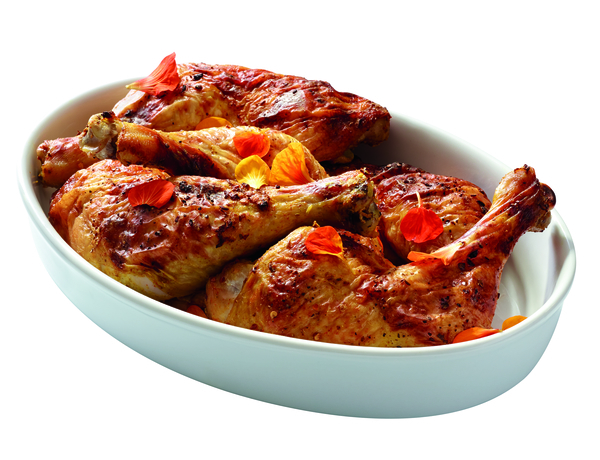 Roast chicken legs get a savory makeover with rich tandoori flavors and gorgeously crisped, lacquered skin. Served hot or cold, they’re downright divine. Plan ahead—they require 6 hours to marinate. When cooking, if the chicken pieces begin to brown too early, cover them with foil and continue baking, and if you have access to nasturtium flowers, scatter a handful of petals over the chicken before serving. Generously season the chicken legs with salt and pepper. In a small bowl, whisk together the yogurt, spices, garlic, 1⁄2 teaspoon kosher salt, and orange zest and juice. Place the chicken legs and the marinade in a large, ziplock plastic bag. Seal, turn to coat, and refrigerate for 6 hours or up to overnight. Preheat the oven to 450°F. Line a baking sheet with parchment paper. Remove the chicken legs from the bag, shake off any excess marinade, transfer the chicken to the prepared baking sheet, and let rest at room temperature for 30 minutes. Roast until the juices run clear when pricked with a knife at the joint, 30 to 35 minutes. Serve warm or store in the refrigerator and serve at room temperature.